Why is engagement so often housed or championed in HR, Organizational Learning and Development or Internal communications? Shake things up for the next year. Put finance, operations, safety, or marketing in charge of employee engagement. Break down the functional silos of engagement so that employee engagement becomes everybody’s business. To read the first 11 suggestions on the Halogen TalentSpace blog, click here. David Zinger is an employee engagement speaker and expert from Canada who works around the globe. People artistry is our plea to focus on the person, not a human resource. People are not resources that should just be managed; they are people we work with every day. People artistry doesn’t reside in a specific department or area of the business; it needs to touch every person from co-workers and people we manage, to cleaning staff and security guards. 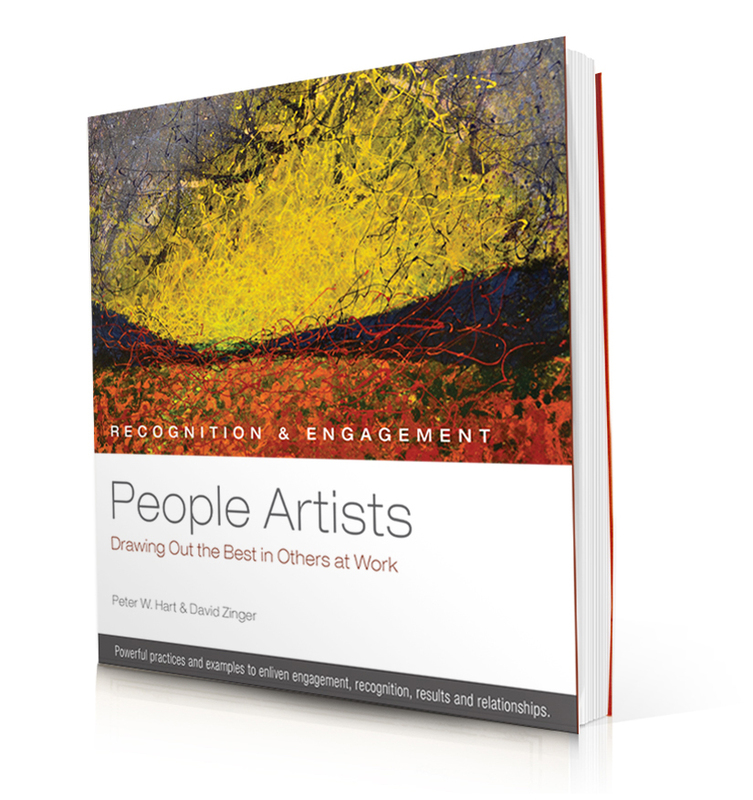 We trust that after reading “People Artists,” you’ll personalize your approach to work. Think of being a people artist as your way to repay the debt to someone who brought out the best in you. David Zinger is a global employee engagement expert and employee engagement speaker. We would not be who we are without the people who brought out the best in us. When is the last time you let someone who drew out the best in you know how big a role they played in making you who you are today? As this video demonstrates, great teachers change lives…it is time to sing their praises. During February We Are Making A Special Offer to You. It would personally mean a lot to me if you would take a couple minutes of your precious time and read this email and then took the next step of ordering copies of People Artists to make work better for yourself and everyone you work with. Are you ready to fully ignite and express your People Artistry at work? Do you know how to draw out the best in others? Are you repaying the debt to all those who brought out the best in you? People Artists by Peter Hart and David Zinger is a pithy, beautifully illustrated book drawing on the wisdom of leaders who are artists in getting people to engage at work. ~ Harvey Schachter, Globe and Mail, January 5, 2016. People Artistry is a social book. We would be pleased if you read the book yourself but we want to assist in creating a workplace that achieves results, builds relationships, and installs wellbeing through a movement of People Artists ready, willing, and able to make work better. Don’t let a day go by without drawing out the best in others and encouraging everyone at work to draw out the best from each other. This slim hardcover book is packed with beautiful art, insights, and actions for work. Think of it as an exquisite mini coffee table book for your office desk. Go ahead and try before you buy. You can even take the self-assessment. Check out a sample of the book by clicking on the title: People Artists: Drawing out the Best in Others at Work. 10 or more copies. During February we are doing out best to help you create a community of People Artists in your workplace. If you order 10 or more copies we are offering this $19.95 hardcover book for just $14.95 plus shipping. 100 copies. Even better — if you order 100 copies for your workplace the price is only $9.95. For under $1000 you can educate, inspire, and encourage 100 people artists where you work! To keep this simple, just email me, David Zinger, david@davidzinger.com and I will personally get your order started and if you can’t wait, phone me at 204 254 2130. During February I will personally look after you even, if you just want to order one book for $19.95 plus shipping! David Zinger is an employee engagement speaker and expert and co-author of People Artists.